Vaughn was too little last year to notice she was getting the shaft, but everyone else who entered the house commented on it. I agree, it looks pretty pathetic. Fast forward to this year. I've looked for stocking kits to start on one for Vaughn but haven't found any that I like. I almost ordered her one that I only half liked to be done with it but never did. Oh, yeah. I had forgotten that I bought it after the Holidays last year at Target for a dollar. Guess I figured it would be a good place holder. Vaughn is old enough to notice things year, but interestingly hasn't questioned why Vance's stocking is all pimped out and hers isn't. She immediately loved it. I'm guessing the pinkness has something to do with it. It's with extreme guilt that I started to pimp Vaughn's stocking out last night. I stitched her name on top and today will continue to add beads, buttons, and whatever sparkly bits she can find in my sewing stuff. 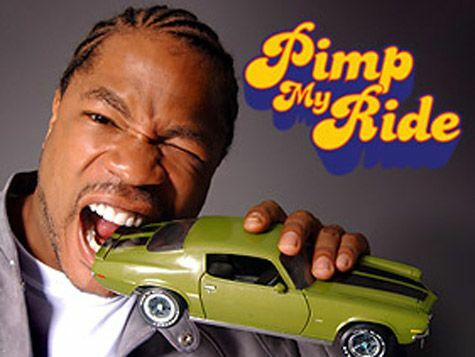 I'll try to live up to Xzibit's awesomeness today. I'll let you know how it goes. This has nothing to do with the story but last night I dreamt that Travis Barker bought us a new playset for the backyard. Such a nice guy. it amazes me how similar ella and miss v are!! e has been up. in. my. business about not having a stocking like everyone else's. daily! i'm going to crack at some point and just throw away all of the other stockings instead of just making hers. i need an easy button. Did you pimp it out yet? I always have good intentions of making those stockings for the kids every year but there so much work!!! !